When the Emperor calls upon you to do his bidding on some far-off world, you need to be ready to go at a moment’s notice. You can’t always drop by your secret lair on Mustafar for a quick wardrobe change—your master is not known for his patience. And neither are you, which is why our voice sounds all shaky right now! Or maybe that’s because you’re also kind of our hero. We may not be the biggest fans of your earlier work, but we feel like you’re having a late-career renaissance. And we’ve admired your style from the very start! 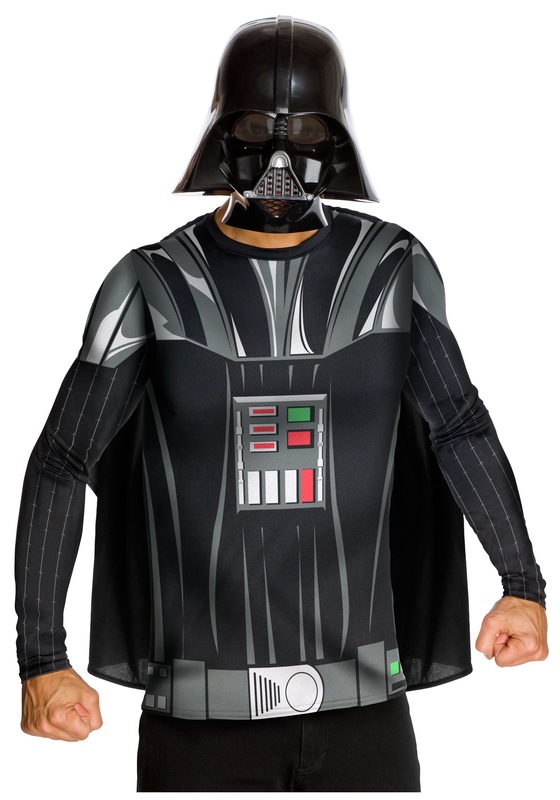 So we think you’ll be most impressed by the look and convenience of this Darth Vader Top and Mask. It’s perfect for a surprise inspection of an Imperial outpost or an impromptu dogfight with a squad of Rebel X-wings! And while it’s not as roomy or luxurious as your main suit, it’ll keep you breathing in a pinch. If anybody thinks this lightweight version of your signature look is less than intimidating, all you have to do is offer them a travel-size Force choke! Which is really a one-size-fits-all maneuver. But we wouldn’t worry about that. You’d be surprised how much more sinister even a waist-length cape can make your appearance! Plus, adding a pair of black gloves or some awesome boots will really help your credibility. And nobody’s going to interfere with your mission as long as you remember to pack your lightsaber!